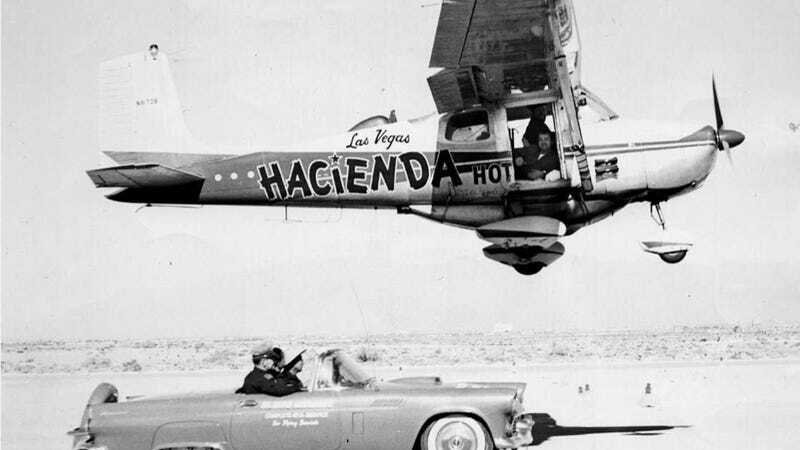 Maybe you've never heard of the Hacienda Hotel, but you may have seen a Cessna 172 with "Hacienda" plastered on the side in big, goofy letters hanging in the Las Vegas airport. They're connected. The plane's owner worked at the Hacienda, and, along with a co-pilot, set the record for the longest manned, refueled flight in 1959 by traveling 150,000 miles without landing. Here's how (and why) they did it. Back in the '50s, the Hacienda's owner had big ideas about running a family hotel in gangster infested Las Vegas. Known as "Hayseed Heaven," amongst nightclub chic detractors snubbing it from the relative glitz of the Strip, the Hacienda sat alone on dusty, vacant land south of town. Hacienda was a low-buck joint at the time — probably something like the place where Clark Griswold played war in Vegas Vacation. But Judy and Warren "Doc" Bailey thought that it would take off eventually. In 1958, hoping to garner some family-friendly publicity for his hotel, Doc Bailey backed an endurance flight. A slot machine mechanic named Bob Timm and an airline pilot named John Wayne Cook broke the world record on Jan. 23, 1959. When they finally landed, they'd been in the air around Southern Nevada, California, and Arizona for 64 days, 22 hours, and 19 minutes. Timm had actually tried three other times to break the record in the Cessna in 1958, but none of those flights lasted more than about 15 days. Plagued with mechanical problems, he also didn't see eye to eye with his first co-pilot — not good considering they were to spend a couple of months shoulder to shoulder in a very small space. During one of those proto-flights, the sky lit up with huge flash as the military detonated a nuclear bomb above ground. The blast came before too many people realized what a terrible idea that was. First, there was the issue of fueling. They installed a 95-gallon belly tank on the plane, bringing the plane's total fuel capacity to 142 gallons. The belly tank could be refueled mid-air by grabbing a hose from refueling truck with a hook and a winch. An electric pump transferred fuel up into the wing tanks. They refueled twice a day by arranging meetings with the tanker truck. Whoever was in the co-pilot seat hung a little platform out the window between the fuselage and the wing strut so that he could step outside the plane and refuel (the platform was also used to wipe the windshield). The setup worked pretty well; 128 times as a matter of fact. The only hairy refueling they reported was when they had to do one at night once. There was no way they could cheat and land at another airport to refuel without getting caught. Shortly after takeoff, a guy sitting in an open Ford Thunderbird convertible had painted a white stripe on the landing wheel, and that could never be reached from the cockpit, even with the little platform attached. Timm had replumbed the plane's oil lines to that engine oil filters could be changed without shutting down the engine. Unfortunately, the generator crapped out on day 39, so they had to use a handpump to move fuel up to the wings for the remainder of the flight. While Timm and Cook could have gone 64 days without bathing or shaving (plenty of backpackers have done it), they couldn't fly for that long without sleeping. But they did bathe and sleep. The co-pilot's seat had been removed, and the swinging fuselage door replaced with an accordion-fold door for easy entrance and exit while the plane was in flight. There was a little sink inside the plane for shaving and tooth brushing, but bathing was done with a quart bottle of water outside on the platform. Can you imagine standing naked and wet outside of a moving plane? It was quite the chore for Timm, who tipped the scales at 240 pounds. There was a cushion running the length of the fuselage for sleeping, but neither man reported sleeping very well. It was nearly impossible to sleep during the day, and the constant din of engine noise made it difficult to sleep at any time of the day or night. One night, Timm dozed off for an hour, waking up at 4 a.m. in a canyon somewhere between Blythe, Calif. and Yuma, Ariz. Luckily, the autopilot was still working at the time. Food was prepared by the Hacienda's kitchen. They used only the freshest, healthiest food available, but before it ended up on the plane, it was ground up and put into a thermos so that it could be passed up to the cockpit more easily. That's actually how they got water, towels, and laundry, too., from the supply truck during refueling runs. Timm and Cook kept their radius within a comfortable distance of their Las Vegas home base, often refueling in Blythe (a desert town on the California-Arizona border) or swinging out to Yuma, Palm Springs, or Los Angeles. There wasn't a lot to do up there, but they kept themselves occupied by leafing through comic books, doing exercises fit for a solitary confinement cell, and playing those lame counting-things games people play when they're on long, boring road trips. Too bad they didn't have books-on-tape back then. On Christmas, Timm sent candy canes earthward to his 6-year-old son by tying little parachutes to them and dropping them out the window while they were cruising over the airfield. Miraculously, neither of them went on a all-work-and-no-play-makes-jack-a-dull-boy rampage during what sounds like mile after endless mile of mind numbing desert flyover. Although they broke the record on Jan. 23, the pair decided to stay aloft for another 17 days, just to make sure no one else took their record after they'd sat in an airplane for so long. No one else tried, so it ended up not mattering. But still, better safe than sorry.